4. Baby car seats are NOT designed to be secured on top of shopping carts. 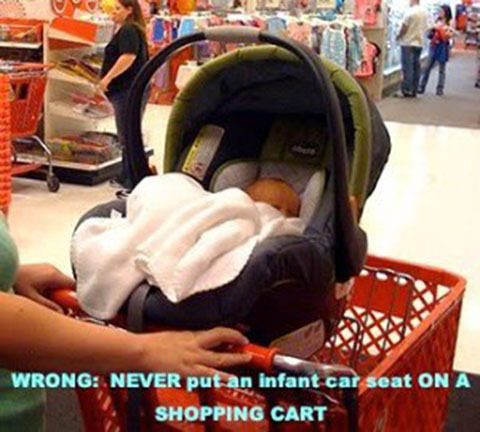 In fact, most shopping carts that you find in grocery stores and supermarkets have warnings saying that baby car seats should not be placed on top of shopping carts. … even when the sign is right down in front of them as they put the carrier on the cart. The big “Warning” sign is right there. If folks will just take time to read them. And for those who read them, they seem not to take the warning seriously … until something tragic happens. 3. Shopping carts can tip over easily — and they’re more likely to if there’s a car seat mounted on them. Did you know that it does not take much weight to tip over a cart? 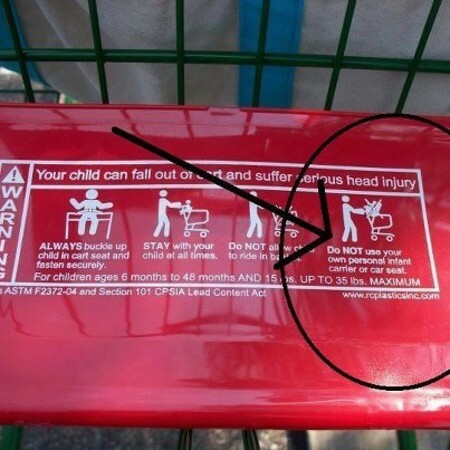 Safety experts say when kids are strapped inside a shopping cart it raises the center of gravity of the cart. As little as ten pounds can tip it over. Accidents happen and they do often within seconds … most especially when shopping carts tip over. Within seconds, your life can change completely. She flipped the whole cart over while still buckled just because I’d taken the groceries out. It was empty, and that makes it light enough that she can flip it. That’s not good … It happened so fast and the fact that she was able to flip it with her own body weight because it was empty … I’m really concerned those carts aren’t as sturdy as they need to be. Tragic stories from car seat on shopping cart accidents are real … see next page.